Try this delicious, wholesome and fresh recipe from two of salt's favourite foodies, Uwe Wullfen and Nilla Tomkins! Do you remember the excitement you felt as a child playing in the garden? The world was your oyster, the trees were your friends, the flowers, pebbles and dirt all played a part in your make-believe games. stem. That ‘snap’ when I picked it off the branch, and the crunch from that first bite, the juices dripping down my chin. Sad as it is to admit, those days of marvel were gone for me until I had my own children. But they reminded me things can still be full of merriment, even apples, if we choose to see them that way. Because unlike adults who see a tree as a tree, or fruit as fruit, children look at everything in wonder and see the ripe hanging apples as small treasures to be collected. Now spring is upon us and the cooler weather has all but blown away, maybe it’s time to relive some of those childhood memories in the garden, remember our love of discovery and get back to our roots with our own little ones in tow. Luckily the Sunshine Coast more than provides us with opportunity, and if you’re stuck for ideas, hopefully these ones will get you started. It seems only fitting with all this talk of apples to suggest planting a few fruit trees of your own. And let’s be honest, there isn’t much better than being able to step outside and pluck some juicy fruit right from branches growing in your own backyard. The best type of fruit for our climate is anything citrus. Lemons, limes, oranges and mandarins are so easy to grow, and the blossoms make it worthwhile simply for their fragrance in spring. All you need to plant citrus is a position that receives at least six hours of full sun every day, well-drained soil or a large pot full of premium potting mix. There are dwarf varieties of most fruits available for those who don’t have a lot of space. Caring for your citrus is easy too. Just make sure the trees get a lot of water and are protected from insects, which can be done with regular applications of organic Eco-Oil. Feed them a couple of times a year and prune often to keep them a manageable size. Once that delightful fruit pops up, make a game of picking it with your little ones. Lemonade stand anyone? The Sunshine Coast is spoilt for choice when it comes to strawberry picking. And what could be better on a sunny spring day than plucking juicy red berries before sampling them while enjoying a picnic in the fields. 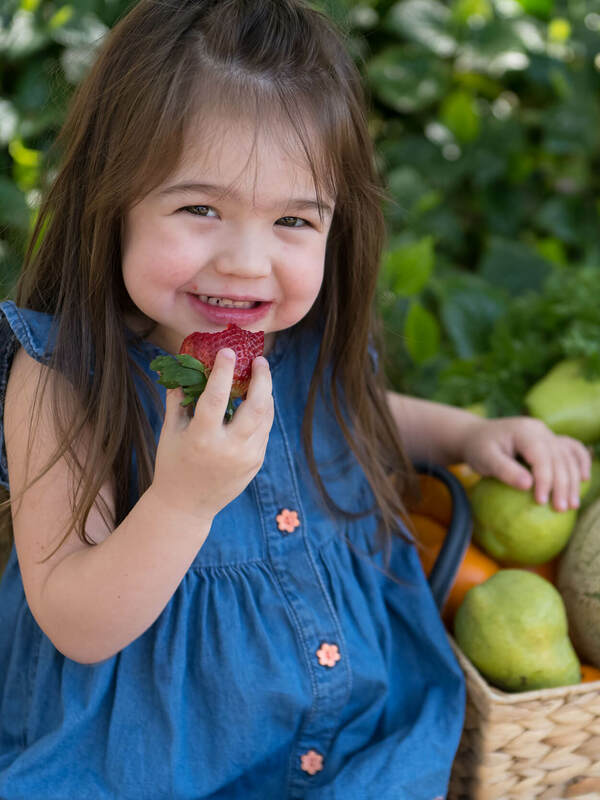 Strawberry picking is an easy outdoor activity and perfect for all ages, plus the sweet treat you can make with your collection is the ‘berry’ on top. an interest in how our food is harvested and a tour of one of the gardens is a great way to show them first hand, especially if creating your own edible garden at home isn’t possible. Visit sunshinecoast.qld.gov.au and search for ‘community gardens’ for a list of gardens on the Coast. of different in-season fruits and vegetables and take them with you to your local market. Make a game out of finding each fruit and vegetable at different market stalls and collecting them in your basket ready to take home and turn into tasty treats. This is also a great opportunity to teach little ones about the importance of eating fresh produce. When they get the chance to see it, feel it and smell it, there is a better chance they will enjoy trying it too. Grab some strawberries, Nutella and shortbread biscuits. Cut the strawberries in half. Spread the Nutella onto the shortbreads and place strawberries on top. Cover a pizza base in tomato paste. Gather a colourful array of vegetables like red cherry tomatoes, yellow corn, green spinach, and purple onion. Chop up the veggies nice and small and arrange the veggies in colours to create a rainbow effect on the bases. Pop in the oven and then enjoy!